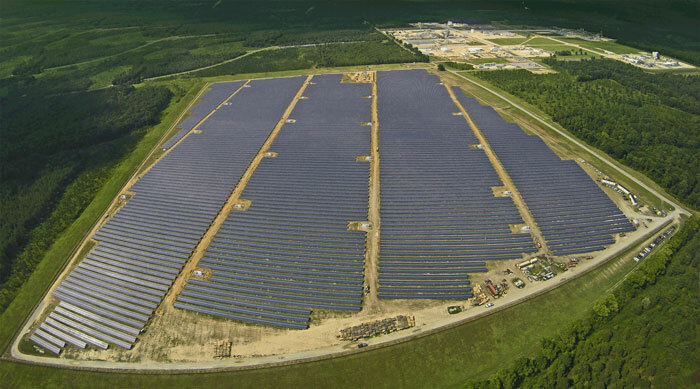 In the U.S. Energy Information Administration’s “Electric Power Monthly” report for October 2015, it shows that utility-scale net generation of power via solar photovoltaic plants from utility scale facilities increased 50 percent during the first 10 months of the year vs. the same 2014 period. In fact, utility-scale solar power generation, measured in thousands of megawatts, increased 32- fold between 2005 and 2014, EIA data show. A relatively young company whose predecessor or sibling entities built up experience with metal fabrication as well as starting up solar power facilities switched gears in order to invent a racking system for photovoltaic panels that could be scaled up fast and installed in the most efficient and economical way possible. It was a circuitous route, but GameChange Racking President Andrew Worden says he’s glad to be serving a growth industry that’s good for the earth and his company will be looking for vendors to expand with him. Throughout his career, Worden has employed a “follow your nose” strategy of entrepreneurship, he says. He runs a private equity firm that invested $490 million over the past 14 years. The firm made acquisitions in metal fabrication and forging. It started a construction company and used $50 million of its own capital to build a total of 10 solar power plants, which were later sold. The initial solar power plant projects were delayed due to the slow production of racks, recalls Worden. “As we waited for delivery of racks to put panels on and studied the engineering behind them, we thought that we could do this way better ourselves,” saving customers money through improved engineering and by using fewer parts. Soon, Worden started up another firm so that, “for the last six power plants, used our own racking designs.” GameChange Racking began work supplying its sister company, the construction firm, then started selling to external customers as well. “About three years ago, we finished building the power plants and decided to sell them, and said, ‘we are doing racks.’ The growth has been absolutely phenomenal—the solar panel industry is growing 30 to 40 percent a year. We grew tenfold the first year, doubled in year two, tripled in 2015 and we expect our sales to triple again in 2016,” Worden predicts. “We are cash flow positive, we have no debt, we pay vendors really fast, and we have earned a profit every year,” he adds. GameChange Racking found it does not need to be vertically integrated to get the required quality in its finished racks. “Our model is there a lot of companies out there that are really good at making metal and roll forming, that already have lines and have been doing it for many years. We own the tooling but the roll formers are rolling our steel. We get the capacity we need from them and can scale up our business by using these third parties,” Worden explains. After aluminum prices rose, GameChange Racking turned more to pre-galvanized steel as its preferred material. Coated sheet is also expensive, according to Worden, so pre-galvanized coil provides “the best bang for the buck.” The company places blanket orders with steel mills for certain rollings and then has the material shipped to the metalformers. GameChange Racking’s end customers include some of the largest electricity producers in the nation but the systems are sold primarily to contractors that build solar projects for utility companies. GameChange launched its pour-in-place solar panel rack-anchoring technology a few years ago and is now a leader in landfill installation, he says. The cost is 40 percent below precast concrete bases. New York City-based GameChange Racking developed and now sells three Post Ground systems, three Ballasted Ground systems and a Power Tracker system. The latest product, Genius Tracker, will be introduced in March. Trackers are rack systems that can turn in two directions so that the installed panels follow the sun rather than being stationary and collecting the rays only part of the day. The tracker market is large, he says, and the revenue per megawatt —at 17 to 18 cents per watt multiplied by 6 to 8 gigawatts projected in 2016 in the U.S.—will total $1 billion, just for trackers. “The world market is a multiple of that and that will grow,” Worden adds. Worden thinks his company’s engineering expertise and innovations such as Genius Tracker will be well received worldwide. “We are looking to export and grow internationally.” The more solar energy systems are built, cost declines as usage goes up, he notes. And growth won’t come solely from established power generation companies. “We are seeing Apple and Amazon starting to run data centers with solar power. We started doing smaller commercial installations and we are now at utility scale. 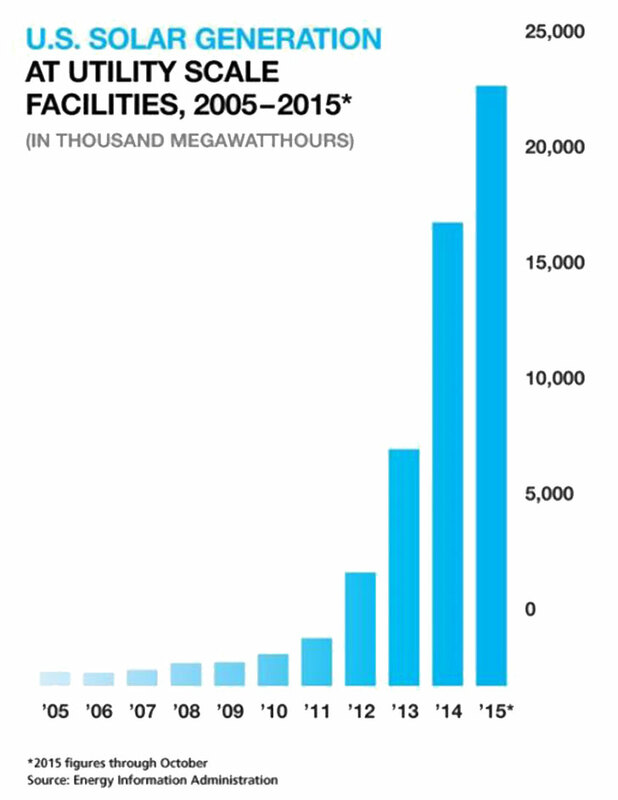 The utility scale installations will continue to be 90 percent of our business,” Worden says.